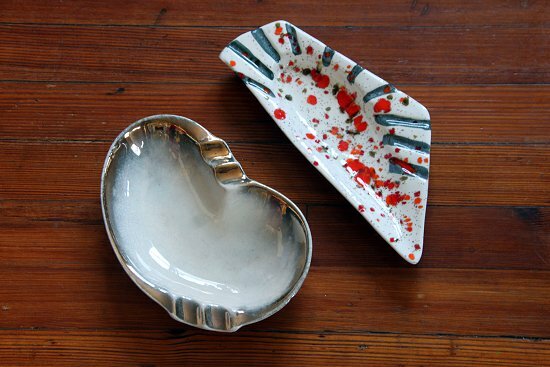 I scored two more gorgeous mid century modern vintage ash trays. These would be perfect for Father's Day. I'm willing to let these go as a daily deal for $12.00 each, otherwise they're getting wrapped up into some Father's Day gift baskets! And I found another dazzling vintage boat plaque! 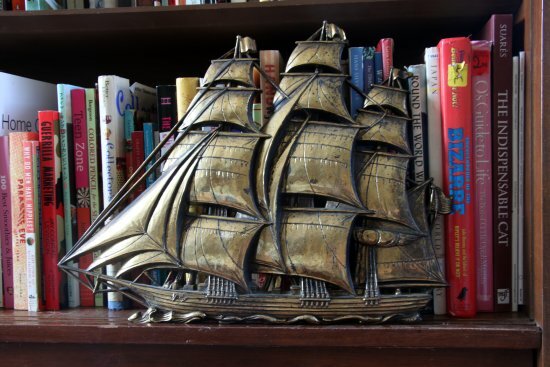 As a lover of all sea-beasts and sea-things my heart sings when I find beautiful vintage boats. This one is for sale for $12.00 if anyone's interested. I'm also smitten by this Russel Wright set in gray with brown speckles. The bottom reads "Russel Wright MFG. By Steubenville." It's beautiful and I need to sell it and get it out of this house before my clumsy self breaks it! 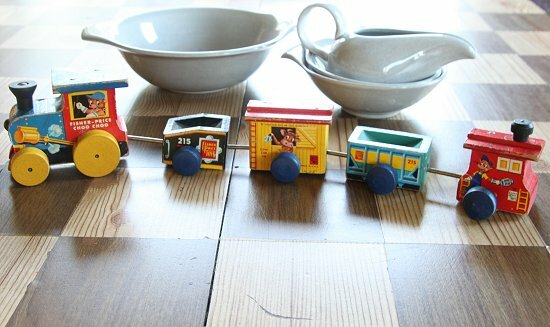 This vintage wooden Fisher-Price "Choo Choo Train" Toy would make a beautiful statement piece in an office, definitely a great gift for the nostalgic dad. I'm letting this one go for $8.00...even though I love how it looks on my desk! 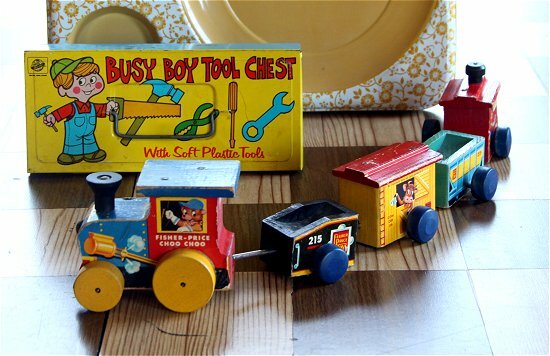 Another boy-gift for the nostalgic dad (you'll note historically that I just love guy-stuff) would be this beautiful "Busy Boy" Tool Chest! I love the whimsical typography, illustration, and bold primary color scheme. I love the writing on the inside. Apparently the old metal tool toys of yore did some expensive damage in the household. If this toy tool box was big enough I'd keep my tools in it, but it's not, so I'm selling this for $8.00. Of course, I couldn't leave the flea market without more toys. 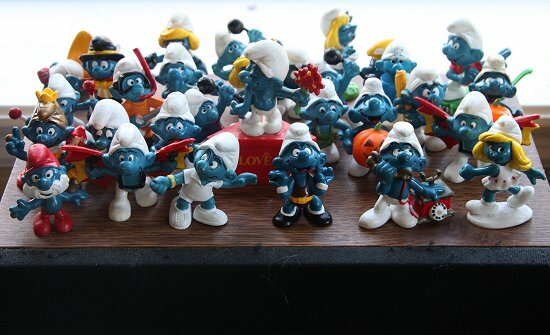 I've mentioned that I hate the smurfs, but this set of original 1980s toys featuring the little blue demons lured me in anyway. Yet again, hopefully another nostalgic fool will scoop them up soon. After a quick hunt, it seems like this set does quite well on eBay! 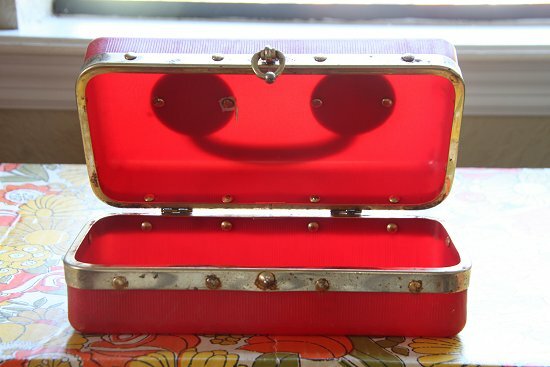 The texture in the metal and bright red of this little old storage box spoke to me. 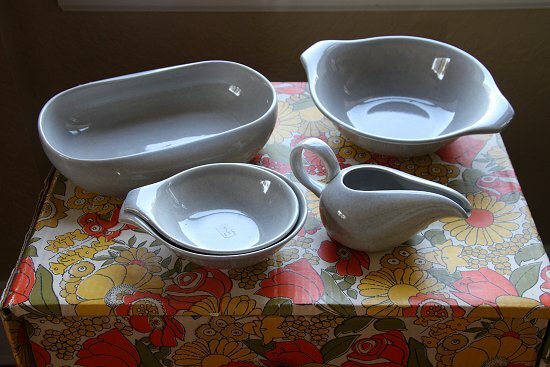 People at the antique store love practical storage items (Need tips? See: How to Make Over Four Figures Per Month at the Antique Store), so I'm sure it'll go quickly there. I'm selling it for $6.00 online if anyone's interested. It's pretty nifty on the inside, too! It's a nice little storage box to hold makeup or toiletries in the bathroom. 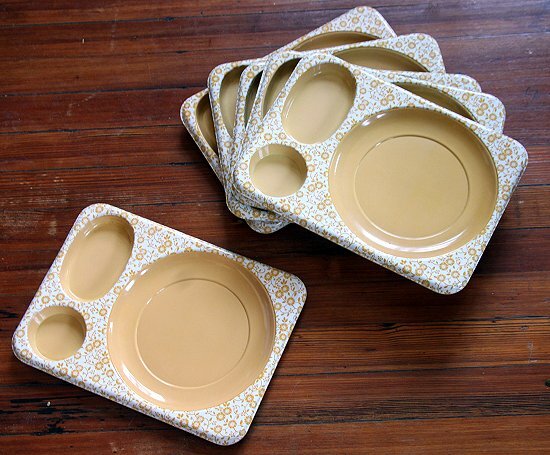 I'm also selling these sweet floral 1950s-1960s serving trays for $6.00. These are so fun to use for veggies or chips and dip at parties. And last but not least, I found cute kitschy magnets to make some grab bags with for my antique store booths. Simply send me an e-mail if you see anything you'd like to buy in these posts. I give you the lowest prices possible when I sell them through the blog, but the prices have to go up once they reach Etsy (still working on launching my own!) or my antique store booth. I also host super thrifty daily deals on Facebook and Twitter! Deals that can't be beat, I tells ya. And with that, I must rush back to making Father's Day gift baskets and tagging merchandise! Oooooo, I love vintage Smurfs. Will you be putting them on Ebay? Great Haul! My favorite is the Russel Wright Set..but I think you're going to get the most out of those smurfs. I think I had those back in the day. I can almost smell that particular sweet plastic smell those small toys used to have. 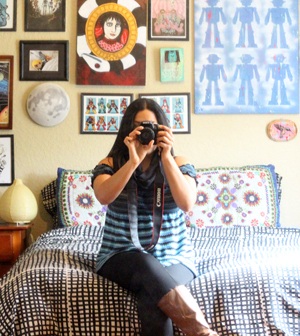 Have you opened your Etsy shop yet? 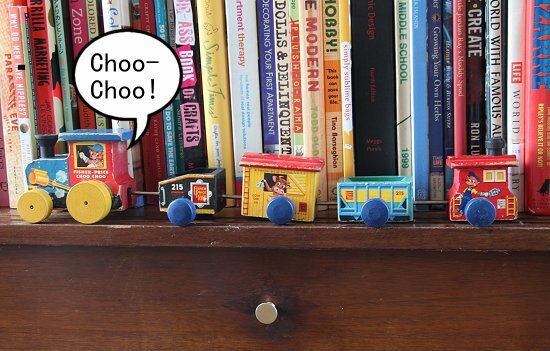 You're right, those toys do have a particular sweet plastic smell that immediately brings the memories rolling back. Florida is a vintage hunter's paradise! Great to hear what you've been up to...I thought things were a little quiet. I was able to nab a few things before the weekend last week. My grandest purchase to date was a ginormous vintage filing card cabinet. I visited a church sale on Thursday night and snagged it for a really great deal. Talk about storage options....I'm thinking photos, tools, craft items, whatever your heart desires!! I also acquired a few smalls that always fit the bill. 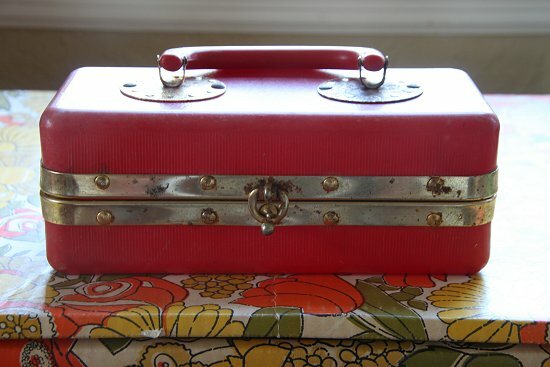 I love the little tool box and the red box....great pieces! Yep, things have been busy the past few weeks. It feels like I can finally sit down and write/photography/work on some great quality posts again! It didn't rain all weekend in Sarasota somehow, but we drove in pouring rain on the way there and back. It's definitely the rainy season! I love all of the owls you scored! Owls just never get old for me! 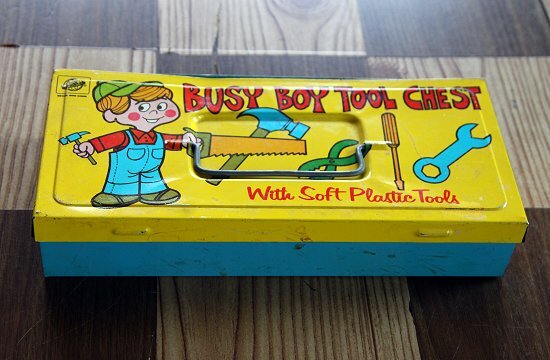 That's hilarious, I think I had that toolbox when I was a kid! 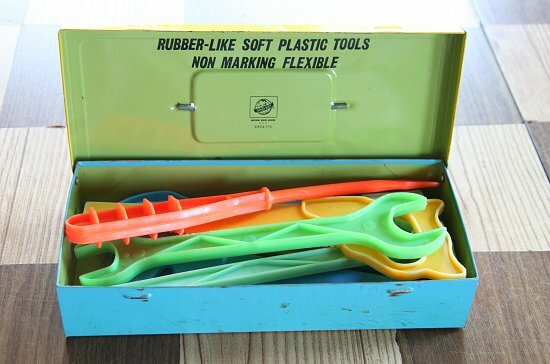 Only vaguely remember the shape and color though. Nice find on the Russel Wright as well.. 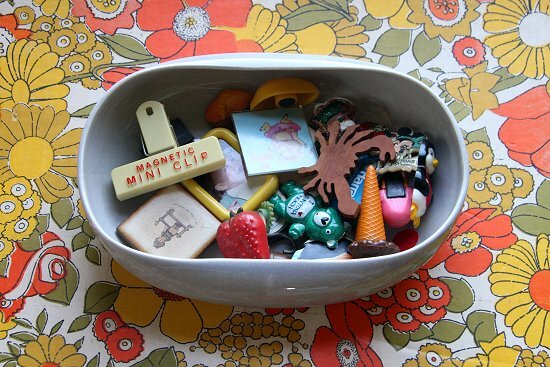 I love the finds that remind me of childhood! Hi Van... thanks for stopping by my blog. Love the vintage, wood train and toolbox you found. Happy thrifting! So many fun things, they all have your style! Those snack trays are so cool! Love the fabric/tablecloth underneath. I swear we had a couch growing up that had those same colors. I've seen couches in those colors/patterns around, love 'em!